Automotive-style alternators, like this 68-amp Delco-style three-wire model from Sierra, are internally regulated. Here at West Marine we often see customers looking for an alternator for two reason. Direct replacement: You need a direct replacement for a factory installed automotive-type OEM alternator. Good news! We have a selection from Sierra alternators for most common marine engines. Go to our Engine Parts Selector to find the alternator you need. Upgrade to your charging system: You want to replace your automobile-style alternator with a larger, higher-capacity alternator so you can charge more batteries, charge larger batteries or bring them up to charge more rapidly. In this case, you’re looking for an alternator from Mastervolt or Balmar, and this type of system upgrade is the topic of this West Advisor. Before you invest in a high-output charging system, save yourself a lot of trouble and dollars by ensuring that you buy the correct system for your application. Charging systems vary by type of boat, as well as a collection of other variables including engine type, engine room space, belt type and size, battery bank size and battery chemistry. Selection criteria you should consider include the following. Each type of marine battery—flooded starting battery, deep cycle flooded battery, gel or Absorbed Glass Mat (AGM) battery—has its own unique charging characteristic, which affects the type and size of alternator you’ll need to charge it efficiently. The Acceptance Rate of the battery—what percentage of its total amp hour capacity it can accept—is different for some battery chemistries. High output alternators like this extra Large Frame Balmar 98-Series Alternator delivers current similar to some gensets, with up to 5kW of output. A standard flooded battery, of either the starting or deep cycle type, can accept charging current equal to 25 percent of its available capacity. Gel batteries can accept 30 percent, AGM batteries can accept 40 to 50 percent, and newer technologies like lithium ion or TPPL (thin plate pure lead, such as Optima) can accept even more. They need to be charged by a large case or extra large case alternator to produce enough charging current, due to their nearly unlimited appetite for amps. Your alternator should be capable of delivering rated output equal to the maximum acceptance rate of your house battery bank. In other words, the alternator’s rating should be equal to 25 percent (lead acid) 30 percent (gel) or 45 percent (AGM) of your total battery capacity. For flooded batteries, size your alternator toward the bottom of this range. As we add electrical and electronic appliances to our boats, we notice that our battery banks have become incapable of handling the loads created by these new stereo subwoofers, floodlights, satellite TV systems, refrigerators and other thirsty power consumers. We start shopping for bigger battery banks, or consider adding a battery. Adding battery capacity requires us to take a look at our charging system. In most cases, your alternator’s output should equal the maximum available capacity of your battery bank. In other words, if your house battery bank is made up of flooded batteries with an amp-hour capacity rating of 400Ah, the maximum acceptance rate of those batteries would be 25 percent, or 100 amps, the ideal alternator would also be rated at 100 amps. If your house bank consists of 400Ah capacity AGM batteries, the maximum available capacity would be 45 percent of 400, or roughly 180Ah. To maximize charging efficiency, a 180-amp rated alternator would be required. Unfortunately, mounting a large-case alternator is not feasible in many vessels. Single 1" foot spindle mount (Motorola style; Balmar Model 621). Typical engine types are Hino, Lehman, Caterpillar, Atomic 4, Universal, Ford, Crusader, Pathfinder, Westerbeke, other Motorola-equipped. Single 2" foot spindle mount (Delco style; Balmar Model 621 with included spacer). Typical engine types are Volvo, Cummins, Westerbeke, Perkins, MerCruiser, Yanmar (6LP), Volvo-Penta, GM, other Delco-equipped. 3.15" ID saddle mount (Hitachi style; Balmar Model 60). Typical engines are MerCruiser, Lehman, Yanmar, Westerbeke, Perkins-Sabre, other Hitachi-equipped. 4" ID saddle mount (J-180 style; Balmar Model 604). Typical engines are Detroit Diesel, Cummins, Caterpillar, John Deere, J-180 off-engine mounts. Drive belt width is a critical factor in selecting a replacement alternator. Commonly-installed vee-belts and multi-groove serpentine belts have specific limits regarding the amperage and horsepower loads they can support. As a rule of thumb, 12-volt alternators use one horsepower for every 25 amps of output, or to put it another way, their ratio of output to horsepower load is 25:1. 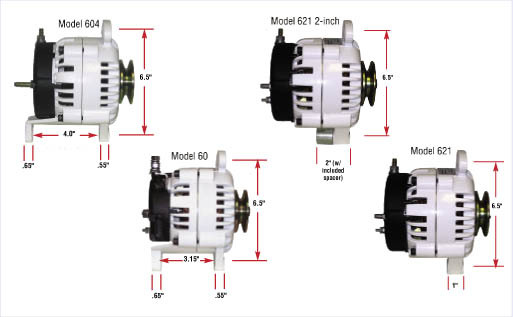 So, when selecting a new alternator, you need to size it for the limits of the capacity of its drive belt. Otherwise, your system will be plagued by premature belt wear, belt slippage and potential damage to your alternator and engine. See the following chart, and note that dual vee-belts and serpentine belts can support much larger loads. In automotive type alternators, current for the alternator is supplied by an internal regulator, which drives the alternator to a specific voltage value (usually about 14.1 volts), which works great for a starting battery, just like the one in your car. Deep cycle and sealed gel and AGM marine batteries require a more complex program of charging voltages to achieve their optimal charge. Multi-stage external voltage regulators, like the Balmar Max Charge and ARS-5 enable the alternator to vary charging voltages, based on the battery’s temperature, chemistry (flooded, gel or AGM types) and level of discharge, to ensure that batteries are recharged quickly and safely. Sailboats: With a single propulsion engine doubling as the primary battery charging source, traditional monohull inboard sailboats require maximum charging output while operating under engine power. 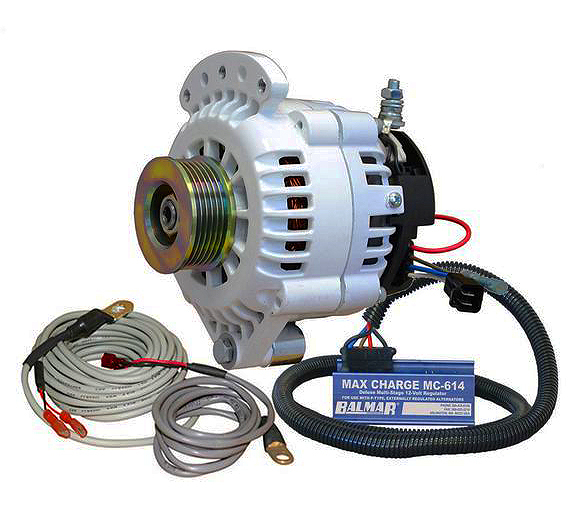 Replacing the stock alternator with a Balmar alternator and multi-stage regulator can substantially increase charging performance. Add the Digital Duo Charge for starting battery care. Multihulls: By combining the outputs of both port and starboard alternators, the multihull charging system can effectively charge twice as much battery capacity. Balmar’s twin-engine Centerfielder II allows port and starboard systems to work independently or together, doubling the output. It monitors both port and starboard alternators and regulators, controls field output to both alternators, making it possible to direct the combined output from both alternators to charge a large central house battery bank. Safety: your replacement alternator should meet U.S. Coast Guard Title 33 safety protection standards. If the alternator is being installed on a gasoline engine, the alternator should also comply with international SAE and ISO standards for ignition protection. Balmar alternators meet all three standards. Heavy-duty construction: marine alternators operate at sustained high output for much of their lives. This requires high-temperature grease, large cooling passages, large or multiple fans, heavy-duty bearings and high-amperage diodes. Standard automotive-type alternators rarely offer the construction required to meet the demands of large marine charging systems. Temperature compensation: the ambient temperature of your batteries and alternator both effect charging efficiency. Max Charge and ARS-5 regulators both sense battery temperature and can regulate charging voltage accordingly. Alternator temperature sensing can also save your alternator by reducing output if the alternator overheats. Both alternator and battery temperature sensing features require optional temperature sensors (MC-TS-A and MC-TS-B). Wiring and fusing: wiring between the alternator and the batteries must be matched to the amperage rating of the replacement alternator. 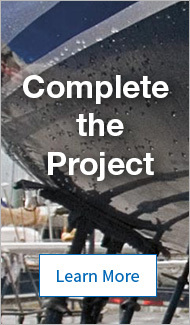 A wiring chart, based on amperage output and wire length, is included in the Balmar alternator installation booklet. Temperature ratings are often determined using a military standard of 122°F, measuring the ambient air temperature in the vicinity of the alternator. Sustained operation in hot engine room conditions will reduce alternator output. A hot alternator, operating at approximately 180°F–200°F will only supply about 80 percent of its rated capacity. Large-frame models generally run cooler than their smaller siblings because of their ability to dissipate heat. Small case alternators are not designed for continuous high-output operation. Alternator polarity depends on whether field (excite) voltage is applied to the alternator’s positive or negative brush. Balmar alternators and regulators are P-type. An experienced auto or marine electrical shop should be able to convert your N-type alternator for use with a P-type external regulator. Rotor RPM is the speed at which the alternator turns, not the engine. Most engine pulleys are roughly double the size of alternator pulleys, so alternator speed is typically twice engine speed. Balmar’s 7-Series alternators are designed to spin at speeds to 15,000 rpm, making them suitable for diesel or high-revving gasoline engines. Large frame 94 and 95-Series alternators are designed for diesel engines, and should not exceed 6,500 rpm. Dual alternators are an increasingly popular alternative on many engines. If excited by a single multi-stage regulator, both alternators can work together to handle large single battery banks. In addition, many dual alternator applications will use the standard alternator to charge the starting battery, while the second, high-output alternator is dedicated to the house battery.